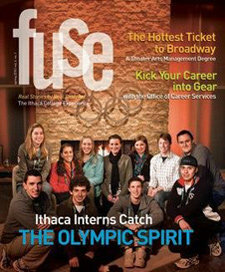 The Spring 2010 Issue of Fuse Is Now Online! Written by 4/7/2010Share this story on Facebook! See what life at Ithaca College is like from a student's perspective. Follow Ithaca College students as they intern at the Vancouver Olympics; work with Jonathan Demme on a Bob Marley movie; build robots (and problem-solving skills) with Legos; make four-footed friends at the SPCA; volunteer in a Haitian refugee village; and more! Take a look and tell us what you like, what you don't, what you want more of and what you could do without. We love to hear what you think!